Create beautiful fun-flowers in every season with wool, yarn, ribbon or raffia in different shapes and sizes. 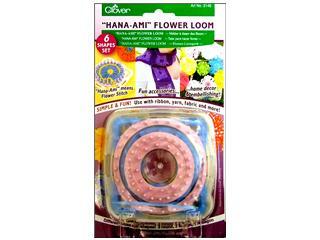 The Hana-Ami Flower loom is the perfect embellishing tool for all ages. The flowers can be joined together to make beautiful wearable art and home decor accessories such as pillows, trimmings and bags. Six shape sets included: Square looms (large & small) Hexagon loom, Round looms (small, medium & large) with base cover centering loom and tapestry needle. Looms make flowers ranging in size from approximately 1-9/16in to 3-3/8in.